The Ironmaster 75 lb Quick-Lock Adjustable Dumbbell System With Stand Is COOL! Hey, there is zero doubt that the Ironmaster 75 lb Quick-Lock Adjustable Dumbbell System with stand is cool. I mean, look at the two adjustable dumbbells and their stand; they are a piece of modern art! But, cold does not always imply useful or even good, so, we have got to ask ourselves if these ultra cool Ironmaster 75-pound adjustable dumbbells are also the best adjustable dumbbells. Made out of chrome-plated metal and welded steel, the weight-adjustable Ironmaster dumbbells are super heavy duty! However, they are not a super heavy. At their most large setting, they tip the scales at 75 pounds apiece. They are also ultra adjustable being adjustable from five to 75 pounds each in 2.5-pound increments via a proprietary quick-lock system that takes just a few seconds to use. The Ironmaster brand is one I respect and is one I have used for decades. And, the build of these Ironmaster adjustable dumbbells is top notch. The quality of these dumbbells is so high that they come with a limited LIFETIME warranty! The Ironmaster Quick-Lock design is straightforward to use and extremely fast! 75-Pound Upper Weight Limit per adjustable dumbbell is plenty stout for most home lifters. Their super small footprint of a mere two square feet is fantastic for people who want to lift in a small area such as an in a bedroom, apartment or office. 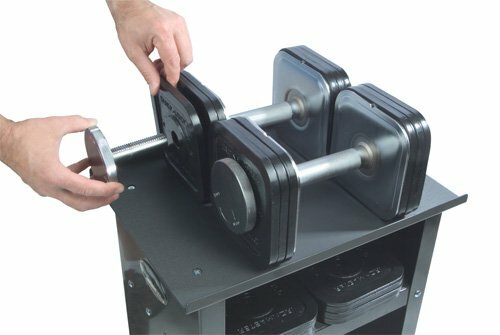 The Ironmaster stand that is included for free with this pair of weight-adjusting dumbbells keeps everything together in its small footprint. 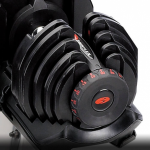 The looks of these Ironmaster 75-lb adjustable dumbbells with stand are incredible! The black and chrome adjustable dumbbells with stand are made up of clean lines and sleekness. They are very minimalistic. The cost of these Ironmaster adjustable dumbbells is not friendly. They have got to be close to the most expensive pair of adjustable dumbbells being sold on Amazon these days. 75-Pound Upper Weight Limit per adjustable dumbbell will not be substantial enough for some lifters. If you genuinely want to go HEAVY, you need to find a different pair of adjustable dumbbells. The looks of these Ironmaster 75-lb adjustable dumbbells are not for everyone. After all, beauty is in the eye of the beholder. If your eye does not like the minimalistic design of these adjustable Ironmaster dumbbells, these may not be for you. I love adjustable dumbbells because I love circuit training in small spaces. My adjustable dumbbells allow me to do just that. And, what makes a circuit training workout program so effective it is that it hits the WHOLE body in a brief period. If you are new to working the entire body with dumbbells, check out this video featuring physical therapist Jeff Cavaliere. In it, this ripped dude teaches eight of the most effective dumbbell lifts on the planet: the dumbbell curl and press, crush grip goblet squat, thrusters, farmers carry, one arm dumbbell incline bench press, dumbbell pullovers, dumbbell swings, and tripod dumbbell rows. If you are looking for a top-quality pair of adjustable dumbbells that is easy to use, fast to adjust and takes up very little space, the adjustable Ironmaster dumbbells could very well be THE BEST ADJUSTABLE DUMBBELLS FOR YOU. However, if the price is a factor or if you want to lift very heavy, these adjustable dumbbells will not be the best adjustable dumbbell choice for you!